IBM DB2 data audit solution by DataSunrise provides the full analysis of all user activity and changes to IBM DB2 database and queries directed to it. Any protection policy violation can be immediately detected and stopped. This includes, but not limited to, monitoring of SQL-requests and unauthorized access to sensitive information. Revealing security vulnerabilities and other problems of information system operation cycle. More detailed information on monitoring feature is available here. IBM DB2 Audit by DataSunrise has a self-learning feature to analyze most often used SQL queries and create a list of assumed safe queries, which helps to focus on unusual transactions. It is also a useful tool to prevent insider attacks notifying of any suspicious queries from authorized users. As for the IBM DB2 audit results, they contain target database information, SQL codes of overridden queries, database errors and session information, including when and which the host made a certain query to the database and what was the result of the query. IBM DB2 audit logs provide the opportunity to investigate data leaks, evaluate their cost and detect the culprits. 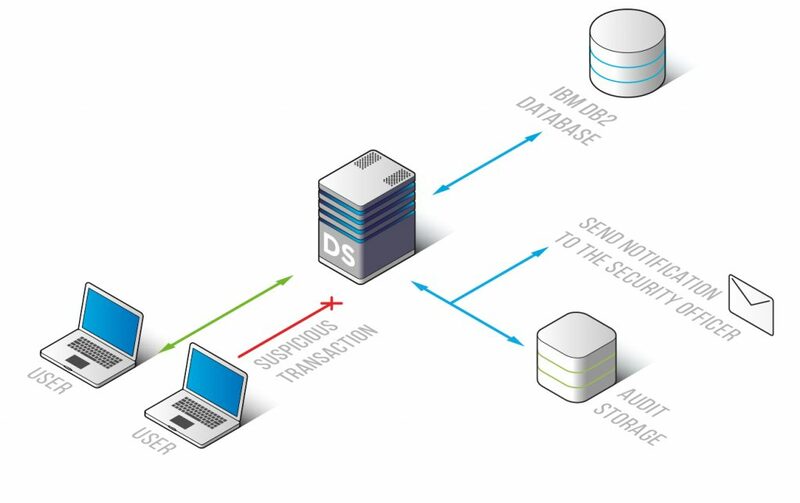 IBM DB2 Audit supports the Syslog protocol, thus it is compatible with any existing SIEM-system. IBM DB2 data audit solution by DataSunrise is a comprehensive utility that will help you to protect your database from attacks performed both from the inside and outside. It is powerful software controlled within a simple interface, which will complement the security system of your database.